Once again I will admit that I'm not a super fan of any mainstrean media television. I think all the channels have issues being that somehow they forgot how to report the news and instead only offer up editorial commentary. Now with that being said, if I do so happen to watch a news channel the only one I seem to be able to stomach is MSNBC. I love Melissa Harris-Perry on the weekends and I do enjoy watching the Rachel Maddow show. I've tried to get into Rev. Al's show, but the way he reads the teleprompter irritates me because he comes across too wooden on television. I love me some Tamron Hall and I appreciate the commentary that Goldie Taylor and Joy-Ann Reid brings to the table. 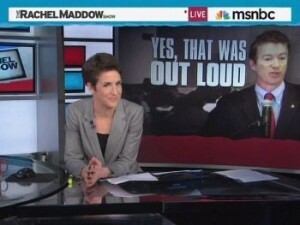 Now with all that being said, my love for MSNBC grow immensely when I watched how Rachel Maddow and (believe it or not) Toure challenged some very interesting stories that had taken place in the news. Watch the video below to see Rachel's takedown of Paul. Now let's talk about Toure, who might I add I historically don't agree with on much, but this time the brother definitely came through in expressing how I felt about L.L. Cool J's new song, Accidental Racist,' with Brad Paisley. Honestly I don't know what the hell Ladies Love Cool James was thinking when he decided to work on this song. That Hollywood swag must be going to his head. On Wednesday's "The Cycle," Toure made his hatred for the song known. "I'm not giving out any good grades for the effort. It's a horrible song. And moving aside from the aesthetics ... the message is extraordinarily problematic," he said. Touré criticized Paisley for his desire to wear a Confederate flag. "You can't just re-appropriate the symbol as you wish," Toure said. He added, "LL Cool J taking the 'forget the slavery' mentality? What are you talking about?! Mama should knock you out!" I'm loving me some MSNBC right now! Oh and for the record, L.L. Cool J and Brad Paisley did try to defend their song. Let's just say that the explantion made things worse, in my opinion, than better. But watch it and let me know what you think.